Born from a legend about a howling iron wolf, Vilnius stands at the cusp of east and west, a testament to the Lithuanians' record as the last pagans in Europe and warriors who in medieval times expanded their empire as far as the Black Sea. A UNESCO World Heritage site, the city's enchanting Old Town is a visual feast, thanks to its churches, meandering cobbled streets, palaces and intimate courtyards. 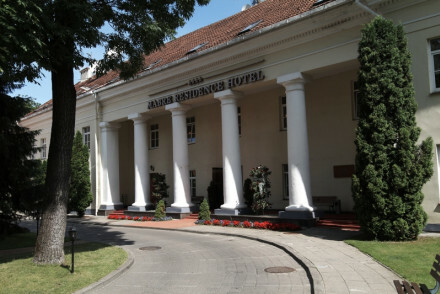 It's also where many of the best places to stay in Vilnius are located. Amongst a wealth of architectural styles, Baroque is dominant, resulting in echoes of a Jesuit town somewhere in Latin America, except that here the tapering crosses of the Catholic churches combine with the Pagan symbols of the sun and the moon: wife and husband in Lithuanian mythology. As for hotels, from our selection of the best places to stay in Vilnius there are some notable examples occupying historic Old Town buildings and others that mimic historic elements. Less evident are bolder, more cutting edge places. Any exploration of Vilnius should, if possible, be combined with a trip to historic Trakai, 28 km away, and Europos Parkas, the open-air museum with over 100 works by world-famous artists which is 19 km away. Meander through Vilnius's Old Town and take in the impressive architecture all around. Sts. Peter & Paul's Church, St. Anne's Church and The House of Signatories are wonderful examples of this! 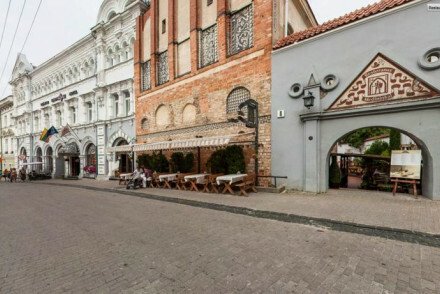 Culture vultures should check out the Vilnius Museum of Illusions, the KGB Museum and, if you're into your history, then you'll enjoy visiting Gediminas Tower. Or, if you fancy a break from sightseeing then enjoy a picnic in the picturesque Bernadine Gardens - a tranquil spot in which to relax for a few hours. To avoid disappointment be sure to book ahead as the best places to stay in Vilnius fill up quickly, especially in the busy summer months. The nightlife is cosy, there are little bars everywhere poked into little gaps in medieval architecture, and it's an easy city to get around. There's also something beautiful and romantic to look at with every turn. One of the best places to stay in Vilnius for a romantic break, the Stikliai Hotel is reminiscent of a small chateau or villa. This is partly because the 29 rooms are arranged around a central courtyard - also a gorgeous, well known restaurant - and they're all decorated individually, some with four-poster beds. It used to be a tavern with apartments above for rich merchants. 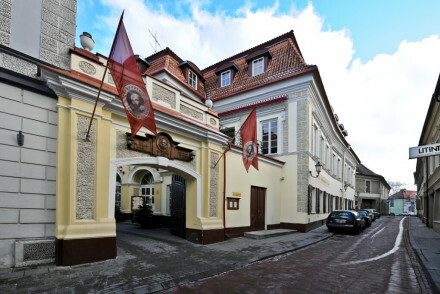 It's also one of the best places to stay in Vilnius if you want to be close to the historic centre. If the two of you have something to celebrate then the Europa Royale Hotel, with its spectacular-church-spire-views, is superb. Once a lavish 19th Century mansion it's still pretty lavish. In summer the charming, vaulted Medininkai restaurant spills out into the courtyard. 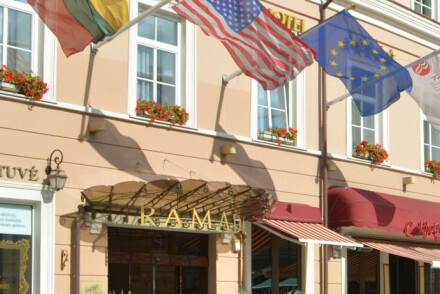 If you're looking for traditional elegance without breaking the bank then Ramada Hotel is the ideal spot. The opulent interiors will transport you back in time to another era, whilst the restaurant is of the highest quality. The 5* Kempinski Hotel Cathedral Square oozes luxury - with elegant accommodation, marble bathrooms, a spoiling spa and superb cuisine. The ideal spot for a romantic retreat! Vilnius is a good choice for anyone looking for a beautiful, unusual and culturally rich destination, but on a budget. 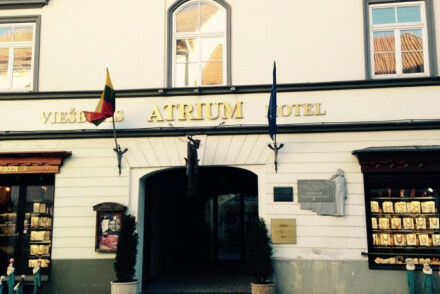 Many of the best places to stay in Vilnius have room rates of under £100 a night. It's has location, tradition and a quirky restaurant in the cellar, yet the Narutis Hotel is still very reasonably priced. It also has a spa with Turkish baths, saunas and jacuzzis. As the oldest designated hotel in Vilnius - it's been 'a place for an overnight stay' since 1581 - it's also one of the best places to stay in Vilnius if you're looking for a unique, historic place to lay your head. 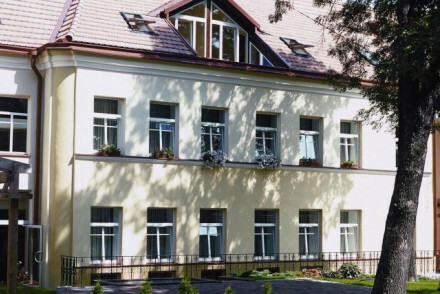 Vilnius Grand Resort offers lovely accommodation, an indoor pool, extensive spa facilities and a golf course - all from as little as £41 per night! A cracking choice for those on a budget. There's a lot to see in Vilnius and many of the great churches and monuments are located in the Old Town. To soak up the feel of Vilnius quickly it's best to stay somewhere traditional, like the Grotthuss Hotel. 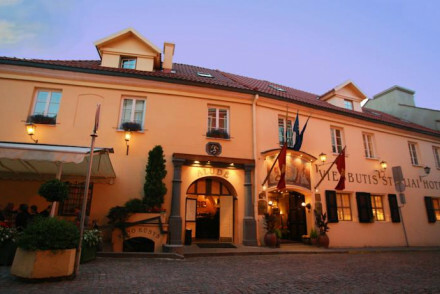 Once part of a 16th Century fortress, this hotel is on a charming medieval Old Town street. The well-known restaurant serves local dishes. Downtown, but off the main tourist trails, the Shakespeare Hotel takes its name seriously. It's not just about The Bard. The rooms and suites are individually themed, named after writers and decorated appropriately. Charming rather than twee, this is one of the best places to stay if you're after easy access to the Old Town's highlights. Centrally located and boasting stylish, atmospheric rooms, Atrium Hotel is a top-notch spot for a city break. Tuck into Argentinian cuisine from the restaurant and spend your days seeing all that Vilnius has to offer. Mabre Residence features smart and spacious suites in Vilnius's Old Town, as well as a lovely steak house and a spa - what more could you possibly need? Vilnius is nicest in the sumer, with the average daily temperature rising to 17°C in July and August. The temperature regularly drops to -5°C in winter so you're best off avoiding coming at this time. The summer however is peak tourist season, so for a quieter alternative consider the shoulder season months, May and September. Visitors can fly into Vilnius International Airport, 6km away from the city and well connected by bus links to the centre. Ryanair fly direct from Luton and Stansted, whilst Wizz Air also go from Luton - with the journey taking just under 3 hours. 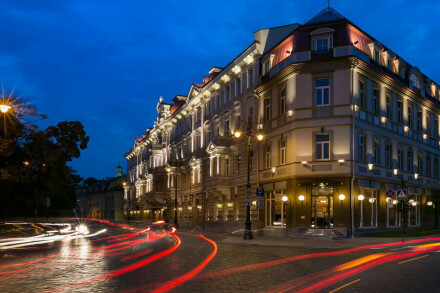 Browse though our list of all the best places to stay in Vilnius. Widen the net to look through all our recommendations across the border in Poland. 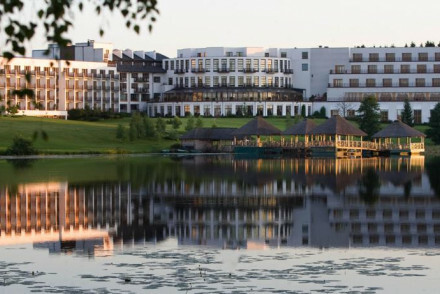 A large contemporary hotel just 20 minutes from central Vilnius, surrounded by pine forests and two magnificent lakes. A host of activities including a championship golf course, indoor pool and indulgent spa. A selection of bars and restaurants. Impressive banqueting halls. A convenient city escape. A renovated 16th century building reworked in a contemporary refurb. Simple rooms decorated in neutral tones with wooden beams and sloping ceilings giving them a loft like feel. A rustic restaurant offers Argentinian dishes and a great wine list to boot. Excellently located for exploring the city. A lavish 19th-century mansion; ideally situated for exploring the city's landmarks. Traditional elegance throughout. A lovely restaurant with a summer time patio and panoramic views of the city's spires from some of the suites. An ideal choice for a city break. Value chic - Situated in the medieval Old Town, with central courtyard, and an extensive wine cellar. Sights nearby - Countless sights within walking distance including Cathedral square, Vilnius Cathedral and the Palace of the Grand Dukes. Great walks - Right on Piața Unirii, boasting a small park with fountains. A beautifully decorated hotel in Old Town. Frescoes, beamed ceilings, wooden floors, gothic vaults, and vibrant colours. Individually decorated light airy rooms. Suites feature Turkish baths and jacuzzis. Quirky cellar restaurant serves traditional and European cuisines. Ideal for a city break. A traditional Residence with elegant rooms and suites, a fantastic steak house restaurant, and beauty spa. Great value, authentic, and centrally located in the old town of VIlnius. Privately owned boutique hotel on narrow medieval street. A characterful building with traditional decoration - stone facades, marble floors, paintings, artworks. Lovely restaurant with courtyard, spacious rooms, and conference facilities. Ideal for business or leisure. Value chic - A homely boutique hotel in the heart of Vilnius’ Old Town, with winter garden restaurant and superb Spanish and French wines. Sights nearby - Just an eight minute walk to the Gate of Dawn, down pretty cobbled alleyways and lanes. Functional elegance behind a classical façade in Vilnius' old town. A combination of contemporary sensibility and old world beauty. Marble columns, Provencal wallpapers, golden touches. chandeliers, giant bath tubs. The restaurant has superior service and classical cuisine. A fine stay. 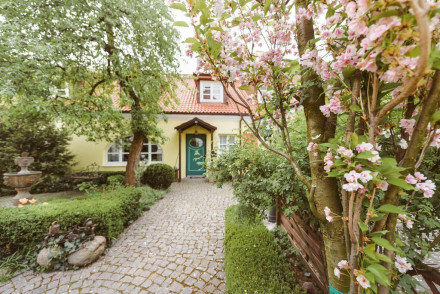 Tucked away within a pretty courtyard this B&B exudes charm. Characterful rooms feature a mix of antiques and upholstered furniture, bold block colours, chintz fabrics and Persian-style carpets. Breakfast can be ordered on request and served in the flower-filled garden. A quaint stay. In the heart of the Old Town but off the tourist track. An atmospheric hotel in the vain of literary greats with charming individually decorated rooms. Lovely restaurant and even a banqueting hall for special events. City Style - A historic hotel with chic rooms, magnificant architecture and a sophisticated bar and library. Great walks - Explore the historic centre of Vilnius, with its well preserved complex of Gothic, Renaissance, Baroque and classical buildings. Local markets - Cathedral Square, the iconic central square of the city, is host to exhibtions, fairs, markets and even concerts. Sights nearby - Within walking distance of Gediminas' Tower, the remaining part of the Upper Castle in Vilnius. 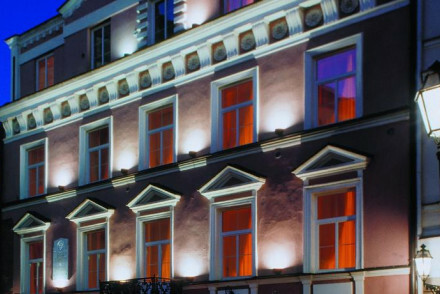 Five Star Luxury in the heart of the ornate and romantic old town of Vilnius, in the UNESCO listed Cathedral Square. Every luxury and state of the art conveniences in this supremely elegant hotel: marble bathrooms, lavish suites, spa and first class restaurant. Hard to beat for business or pleasure. Charmingly decorated hotel with noted restaurant. Rich traditional elegance throughout - rugs, beautiful painted walls, original artworks, antique furniture, urns, and chandeliers. A gorgeous inner courtyard for dining and bedrooms with four poster beds. Truly delightful. City Style - Fluted woodwork and lavish upholstery abound in this classic Vilnius hotel, surrounded by narrow lanes and intimate courtyards. Great walks - Wander the narrow streets of the Old City and admire the architectural jems you'll find hidden on her streets. Local markets - Scour the stalls at the historical flea market or pick up glass crafts around the area. Sights nearby - The hotel is within walking distance of the Cathedral Square.